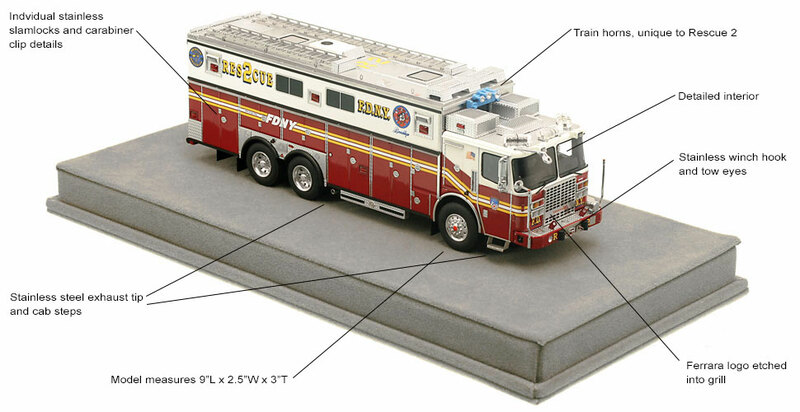 The first museum grade FDNY Rescue 2...featuring over 600 hand-crafted parts. Authentic to Brooklyn's Rescue Co. 2. From the design to the graphics, this 1:50 scale replica emulates Rescue Company 2's Ferrara Heavy Rescue. Our goal with each release is that our customers may notice something new each time they view the model. Razor sharp precision, down to the train horns. Impeccable detailing and true-to-scale parts that only stainless steel can provide. 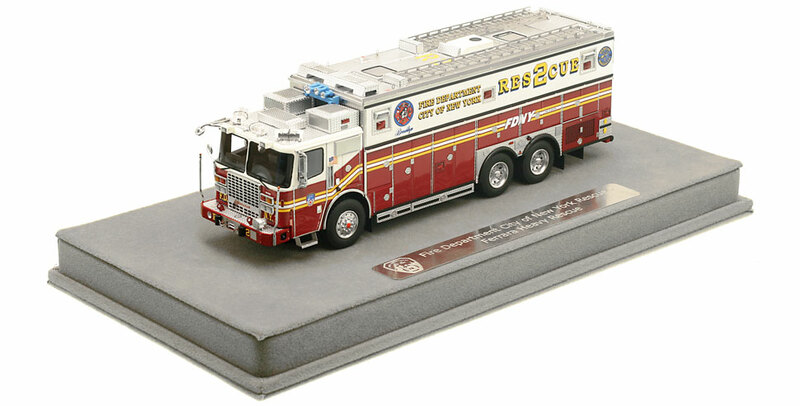 FDNY Rescue 2 ushers in a new standard in 1:50 scale modeling that is sure to impress the most discriminating collectors. Limited in production for enhanced value. A maximum of 300 units of Rescue 2 will be produced. Fire Replicas are designed with the elite collector in mind, and manufactured in limited quantities to enhance future value. The FDNY Rescue 2 measures 9"L x 2.5"W x 3"T and is securely displayed inside a custom case. The case dimensions are 12"L x 6"W x 5.25"T and the platform includes an etched stainless steel nameplate with the FDNY seal, department and truck name. 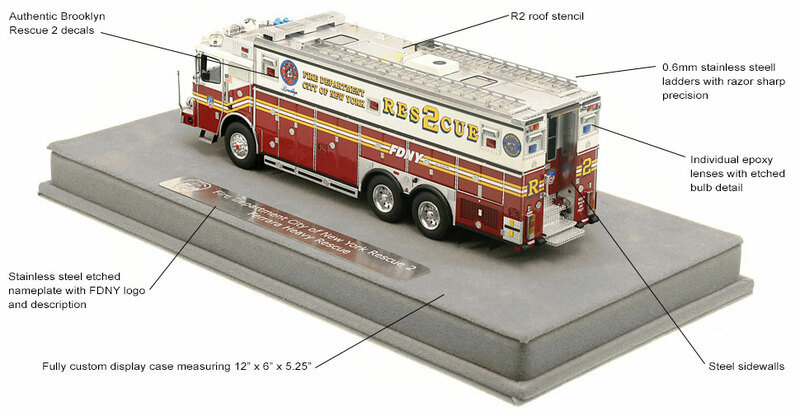 This FDNY Rescue 2 scale model is a museum grade replica. Like all Fire Replicas models, every detail is modeled to perfection and with razor sharp precision. The replica features the specific department configuration and graphics, leaving no detail overlooked. The display case is custom manufactured with high quality acrylic and resin. The stainless steel etched plate features the department and truck name, and department seal. This replica is a treasure to be displayed and admired and is in no way a toy. All New York City logos and marks depicted herein are the property of New York City and may not be reproduced without written consent. ©2017. City of New York. All rights reserved. I was amazed by the detail and description of this model it's terrific I will do all I can say is I love it and I would do business with you in the future. WOW was the first word that came to mind after removing the Rescue from the box. The colors's and decals just pop. Love all the detail front to back and top to bottom, another beautiful model. Keep up the great work. Another great detailed model from Fire Replicas. Paint and finish is outstanding. The best model detail I have ever seen of R-2. Used to see that rig everyday. My only issue is that the plastic display case came in broken. That's the only reason I didn't give it a 5. This model is another home run for Fire Replicas. Amazing true to life details. Absolutely looks like a miniature version of the real rig. One can't go wrong ordering from this company. I started out with the Chicago engine 116 and was amazed at the detail, Rescue 2 doesn't disappoint, the little things are what set it apart and it is well worth the money. This model is insane. The amount of detail fit into such a small unit is mind blowing. Every single thing was thought of. I look forward to seeing the build quality of these units continue to grow. Amazing stuff!! !